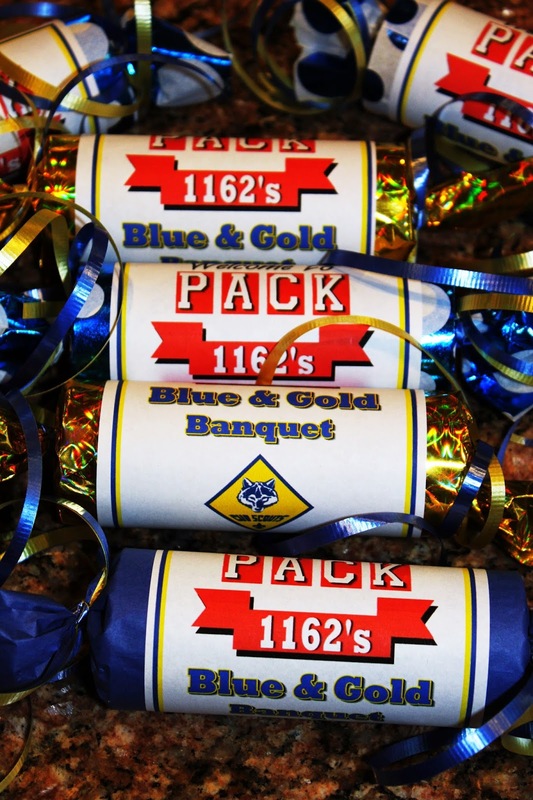 Here is a cute idea for the Blue & Gold Banquet that will really make the table decorations POP! This cute silverware holder could also be used as a napkin holder, and will really make things look festive. I have made it super easy for you. It is ready to print and make. To check out our Blue & Gold Placemat, CLICK HERE. Here is a PRINTABLE idea for a cute invitation for the Blue and Gold Banquet. They look just like neckerchief's, so it really adds to the fun. It is ready to print, add words, and give out. To print the invitation pictured above, click here. (It is really cute printed on blue or gold paper). To print an updated version donated by Pack 703 from Mansfield, Texas, click here. I would like to say a big THANK YOU for this amazing piece of art and your willingness to share it with others free of charge. You can see a picture of it below. I added a blue and gold logo if you want to cut that out and glue to the front to look like a neckerchief slide. Above is the PDF you can print. 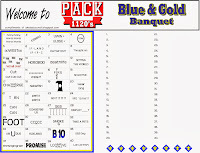 Then you can run the same paper through your printer again to add your own words, fold up and give to the parents to invite them to the Blue and Gold Banquet. If you would like a different logo that is PRINTABLE and can be printed as is (on the left) or personalized with your pack number (like below), click on the picture to the left or below to get more information. I did not make the invitation in Word, but tried to make up a separate form in Word that would give you the wording you could change and be able to print your own, but I couldn't figure out how to rotate the text. I don't think you can do it in Word 2007. If anyone figures out how to do it in Word or another program everyone has that can be edited, (and if your willing to share it), post a message and let me know and I will post it on here for everyone to use. The invitation above was donated by Pack 703 from Mansfield, Texas. To print an updated version, click here. I would like to say a big THANK YOU for this amazing piece of art and your willingness to share it with others free of charge. Here is the wording that is on the invitations pictured here so you can copy and paste and change the wording to work for you. Good Luck! The Cake Decorating Theme is "productivity"
To check out our Blue and Gold Placemat, CLICK HERE. Blue and Gold ideas, CLICK HERE. 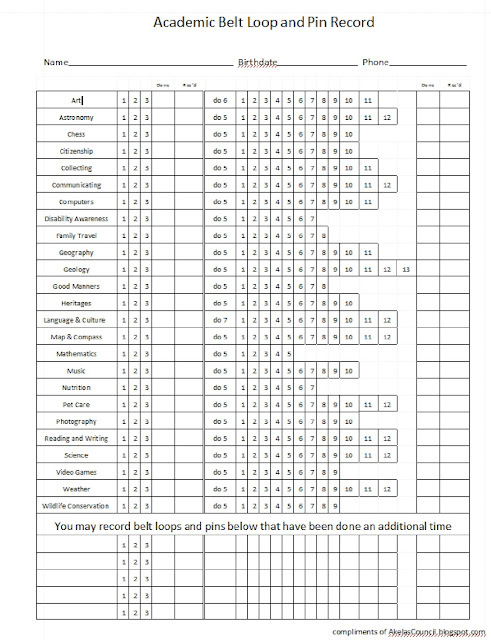 Above is a tracking sheet to be able to keep track of where each boy is on requirements towards each belt loop. There are links below to print one for the Academic belt loops, and another for the Sports belt loops. They are meant to be printed back to back. 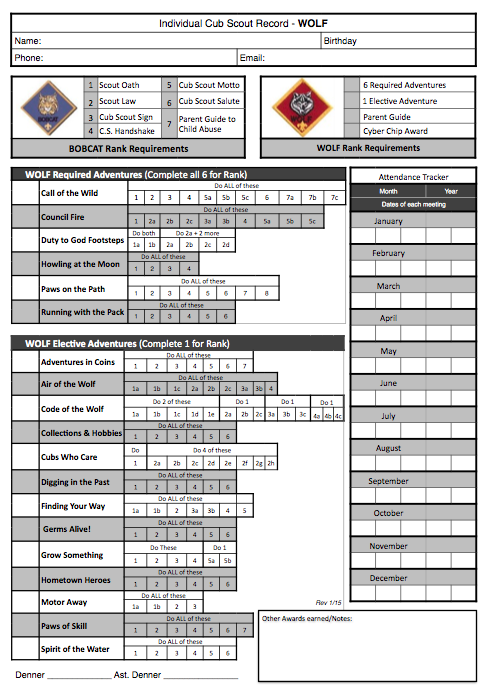 I like to do it on cardstock, and I print one for each boy to be kept in my leader binder next to their tracking sheet for Wolf, Bear, or Webelos. Then I have information on each boy. It helps to do it this way if you do one requirement one week and a different one other weeks. Not every boy is there every week. By doing this, I can always know where each boy is at, and it is all in one place. Below is a sample of the 4 page document I have typed up that shows the requirements for each belt loop. It is faster than having to look through each page of the booklet that tells about each belt loop. 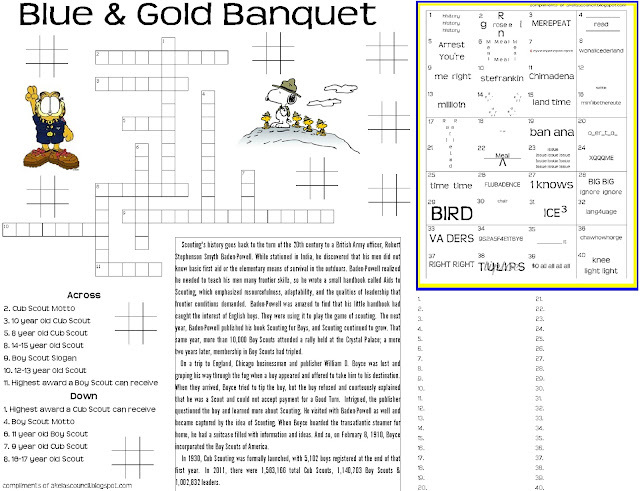 I made a printable puzzle you could use for the Blue and Gold banquet as a placemat. It has a crossword puzzle for Cub Scouting and Boy Scouting, lots of Tic Tac Toe's for the little ones, a history of scouting, and a Rebus Puzzle. This would be something everyone could work on while they were waiting for it to start. Hope you enjoy it! 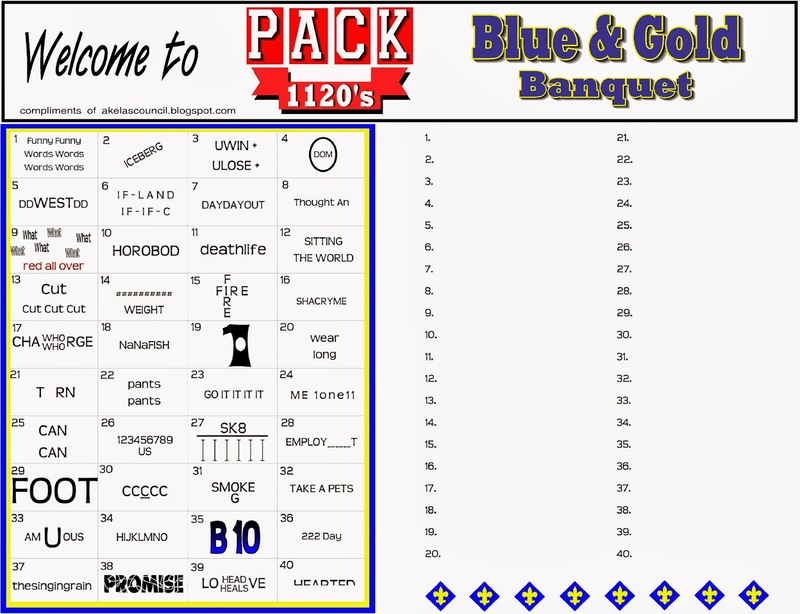 After printing the above placemat to use for our Blue & Gold banquet, everything seemed a little small. I made it a little larger and ready to print on a paper with part on the front, and part on the back. This should give you a lot of options to get the one you like. 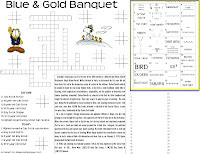 To print the updated placemat front page that has the crossword puzzle, scouting history, and a maze, CLICK HERE. 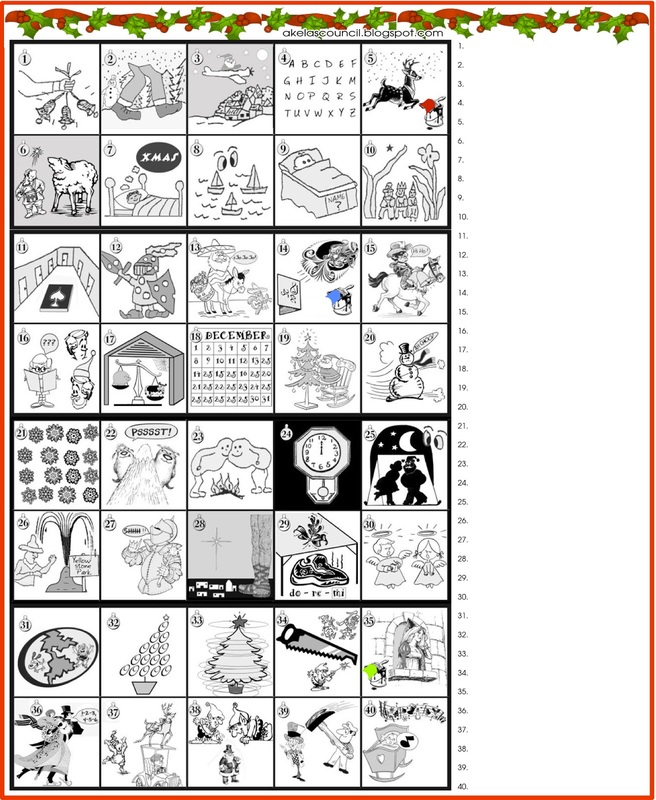 To print the updated placemat back page that has the rebus puzzle and answer sheet, CLICK HERE. 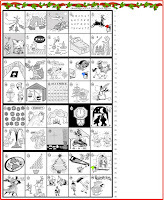 To print the new placemat for 2014 with a completely new rebus puzzle, CLICK HERE. 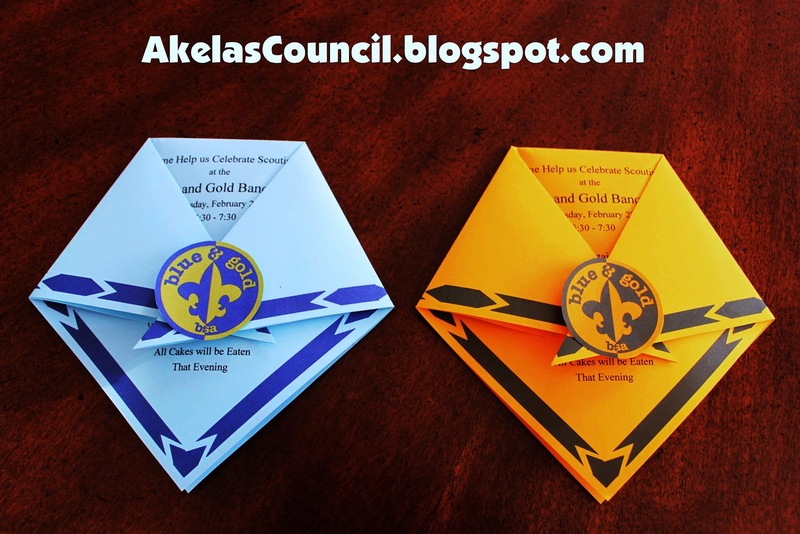 If you don't find what you need there, here is another site below that had lots of fun Cub Scout "fun pages" that are printable. This is a great site! Hope you will check it out. The Invention merit badge (1911–1918) required the candidate to obtain a patent. Boys’ Life magazine, which goes to 1.1 million Scouts each month, was started by an 18-year-old Scout, Joseph Lane, in 1911. A year later, the Boy Scouts of America bought the magazine for $6,100—about $1 per subscriber. James E. West was the BSA’s first Chief Scout Executive. When he took the position in 1911, he agreed to serve six months. At his retirement in 1943, (32 years later) he was given the title of Chief Scout. The BSA is the second-largest Scouting organization in the world. The largest is in Indonesia. One of Scouting’s most popular traditions, patch trading, has bloomed into a full-fledged hobby. Some rare patches are worth thousands of dollars. For all but two years from 1925 to 1976, illustrator Norman Rockwell illustrated the annual Brown & Bigelow Boy Scout calendar—for free. Most are on display at the National Scouting Museum. Former Congressmen Alan Simpson and Norman Mineta served together from the mid-1970s to the late 1990s. They met as Boy Scouts during World War II, when Simpson’s troop from Cody, Wyoming, visited the internment camp where Mineta and his Japanese immigrant parents were being held. The two became—and have remained—close friends and political allies. The first Eagle Scout to earn all available merit badges was Leon Wallace in 1922. In May 1964, 29 of American’s 30 astronauts visited Philmont for a two-week training trip to learn geological mapping and seismographic studies in preparation for the Apollo programs. Three important Eagle Scouts all have names beginning with “A.” The first Eagle Scout is Arthur Eldred (1912) of Long Island, New York; the 1 millionth Eagle (1982) is Alexander Holsinger of Normal, Illinois; and the 2 millionth Eagle (2009) is Anthony Thomas of Lakeville, Minnesota. Scouts collected more than 65 million containers of food during the first Scouting for Food drive in 1988. 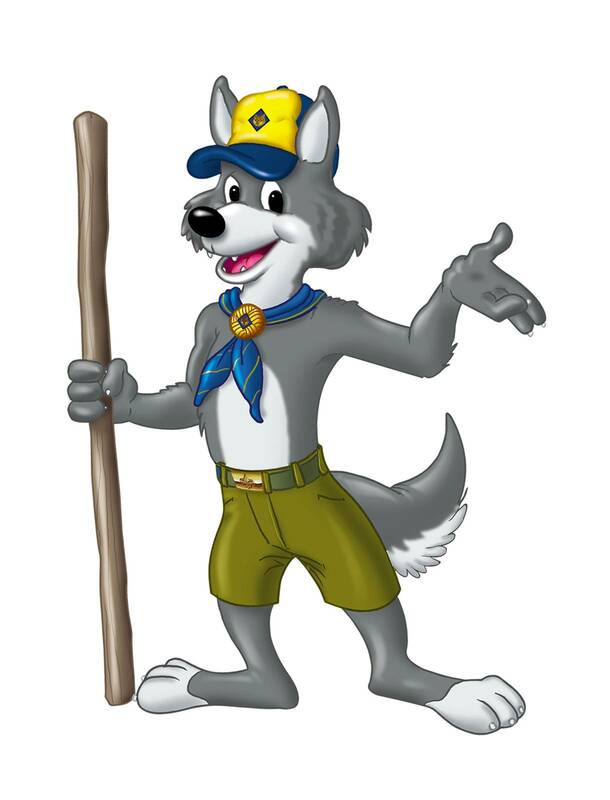 The Cub Scout sign (the index and middle fingers extended in a V shape) symbolizes the ears of an alert wolf. It replaced the Indian “how” sign, which looked too much like the Nazi salute. 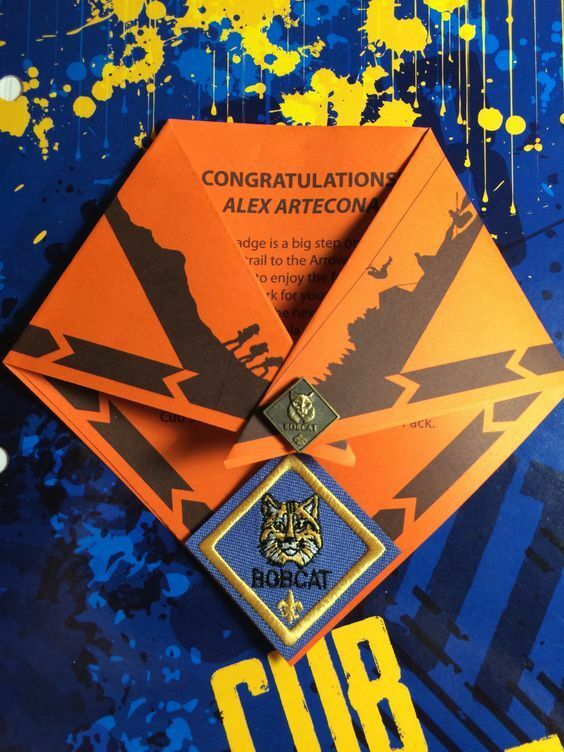 The BSA sells 2.3 million merit badges—one for each person in the state of Utah—every year. By the BSA’s centennial in February 2010, more than 1.2 billion Boys’ Life magazines will have been printed. At age 12, Seattle Mariners Chairman and CEO Howard Lincoln posed for Norman Rockwell’s painting The Scoutmaster. On February 8, 1910, William D. Boyce incorporated the Boy Scouts of America. He personally donated $1,000 per month to keep the organization afloat—on the condition that boys of all races and creeds be admitted. In 1920, the BSA sent 301 Scouts to the inaugural world Scout jamboree in England, where they joined Scouts from 33 other countries. The American Scouts represented all 48 states plus the territory of Hawaii. In 1933, President Franklin Roosevelt requested the Boy Scouts’ service in collecting 1.8 million items of clothing, household furnishings, foodstuffs, and supplies for victims of the Great Depression. After the 1941 attack on Pearl Harbor, Hawaiian Scouts set up first-aid stations and emergency kitchens, helped evacuate civilians, served as messengers, and manned 58 air-raid sirens around Honolulu. During a three-month drive in the spring of 1942, Scouts collected 318,000 tons of paper for the war effort. In a nationwide nonpartisan get-out-the-vote campaign in 1956, Scouts distributed more than a million posters and 36 million Liberty Bell doorknob hangers. In 1954, the BSA conducted a National Conservation Good Turn, distributing 3.6 million conservation posters. In parks, rural areas, and wilderness areas, Scouts planted 6.2 million trees, and built and placed 55,000 bird nesting boxes. Scouts collected more than 1 million tons of litter on Scouting Keep America Beautiful Day in 1971. Russia turned to the BSA in 1993 for help in producing the first Russian Scout handbook; 20,000 copies were distributed. The 20 millionth Scout was registered with the BSA in 1952; by 2000, that number reached 100 million. The gravestone of worldwide Scouting founder Robert Baden-Powell is marked with a trail symbol of a circle with a dot in the center, which means “I have gone home.” It is a tradition that many Scouters follow to this day. While Robert Baden-Powell’s English Scouts had nine points in their Scout Law, the Boy Scouts of America added three more: A Scout is brave, clean, and reverent. Scouts have served at every presidential inauguration since Woodrow Wilson’s in 1913. Boy Scouts who helped out at the Wilson inauguration were Honor Medal recipients. Portions of the 1963 movie “PT 109,” the story of the sinking of John F. Kennedy’s PT boat during World War II, were filmed on Big Munson Island at the Florida National High Adventure Sea Base. When America entered World War I in 1917, membership in the BSA outnumbered the 200,000-man U.S. Army by more than 68,000 members. American passenger railroads helped boost the population at the first national Scout jamboree in 1937—they offered fares at a special price of 1 cent per mile. Wal-Mart founder Sam Walton became an Eagle Scout at age 13, businessman and philanthropist H. Ross Perot at 13, and President Gerald R. Ford at 14. The first Scouts to live in the White House were the sons of 30th U.S. President Calvin Coolidge: John and Calvin Jr. In the aftermath of the attacks of September 11, 2001, Scouts from New York and New Jersey helped reignite the American spirit, collecting more than 153,000 bottles of water for Ground Zero rescue workers—and placing handwritten messages of appreciation and encouragement in their hard hats. The Boy Scout Memorial in Washington, D.C., marks the site of the 1937 National Scout Jamboree. One of the few D.C. memorials to commemorate a living cause, it was accepted in 1964 by Associate Supreme Court Justice Tom Clark on his 50th anniversary as an Eagle Scout. More than 8 million people read Boys’ Life each month. In Scouting’s first decade, dozens of composers turned out Boy Scout sheet music, including John Phillip Sousa, who wrote the “Boy Scouts of America March” in 1916. More than 1.5 million pinewood derby cars are sold each year. If the cars were lined up end to end, they would stretch 166 miles. At the outbreak of World War I, the Boy Scouts of America was the largest uniformed body in the United States—twice as large as the U.S. Army, nearly twice as large as the National Guard, four times larger than the U.S. Navy, and 11 times larger than the U.S. Marine Corps. Each year, the BSA awards 6 million pocket certificates. If stacked on top of one another like a deck of cards, they would be as tall as the Empire State Building, the Washington Monument, both Sears Towers (now Willis Tower), and the John Hancock Conservatory combined. The first African American Boy Scout troop was organized in 1911 in Elizabeth City, North Carolina. The Florida National High Adventure Sea Base is one of the largest scuba-diving operations in the United States, conducting more than 25,000 individual dives annually. These days, boys may earn the rank of Eagle Scout only until age 18, but until 1965, both boys and men could achieve Scouting’s highest rank. Of the 12 men who would eventually walk on the moon, 11 were Scouts. Rafael Petit and Juan Carmona of Caracas, Venezuela, hiked to the 1935 National Scout Jamboree, only to find that it was canceled due to a polio outbreak. They returned for the rescheduled 1937 Jamboree—a total of 8,000 miles. The only recorded Tyrannosaurus Rex footprint cast was discovered at Philmont Scout Ranch. Norman Rockwell designed the first 12 Scout medals for the BSA. Robert E. Peary discovered the North Pole in 1908. When his article on the adventure appeared in print in June 1914, it was not in Harper’s or Collier’s. Only Boys’ Life had it. In April 1937, Cubmobiles, patterned after soapbox derby racers and described as any contrivance on wheels (one, two, three, four, or more wheels) became an annual feature of Cub Scouting. At his family’s request, two separate honor guards of Eagle Scouts played a major role in the 2006 memorial services for President Gerald R. Ford, the only U.S. president to achieve the Eagle Scout rank as a boy. And the only President to serve without being elected, by the way. A young George Herman “Babe” Ruth was a Tenderfoot Scout in Troop 23, promising to do a Good Turn daily. The BSA sells almost 1 million neckerchiefs each year. If laid out flat, they would cover 120 football fields, or 124 acres. In 1927, the BSA created Honorary Scouts to distinguish “American citizens whose achievements in outdoor activity, exploration, and worthwhile adventure are of such an exceptional character as to capture the imagination of boys.” Among the Honorary Scouts were Orville Wright and Charles Lindbergh. In 1981, real Life Scout Harrison Ford made film history, playing fictional Life Scout Indiana Jones in the first of four adventure films. Of 121 merit badges, the one earned most by Scouts across the country is First Aid; more than 84,419 Scouts earned the badge in 2008. The BSA is eco-friendly! In addition to publishing the first “green” Boy Scout Handbook in 2009, BSA magazines Boys’ Life and Scouting have been certified by the Sustainable Forestry Initiative. A Boy Scout was selected to read Abraham Lincoln’s address at the 50th anniversary commemoration of the Battle of Gettysburg in 1913, one of among several national notices the BSA received that year. Home to the world’s largest collection of Norman Rockwell paintings, the National Scouting Museum in Irving, Texas, is 53,000 square feet—it would take some 3.2 million merit badges to fully cover the museum’s floor. Nearly 1.2 million volunteers donate an average of 20 hours per month to the BSA, which totals 288 million hours of time during one year. Independent Sector projects the average value of volunteer time to be $20.25 an hour. Given this hourly rate, the approximate value of the time given by Boy Scout volunteers is more than $5.8 billion annually. A project for Cub Scouts and their parents, pinewood derby cars made since 1954 could form a line stretching from Los Angeles to the island of Tahiti in the Polynesian Islands—a total of more than 5,500 miles. If a Boy Scout attends his weekly patrol and troop meetings, participates in a monthly weekend troop outing, and attends long-term summer camp with his troop, he will have spent as much time with Scouting in a year as he spends in the classroom. The Boy Scout Handbook has had Braille editions for many years; merit badge pamphlets have been recorded on cassette tapes for the blind; and closed-caption training videos have been produced for those who are deaf. Former Sea Scout Paul Siple coined the term "wind chill". He experienced the phenomenon firsthand when he accompanied Commander Richard E. Byrd on an 18-month voyage to Antarctica. During 1950's and 1960's, the world's second largest navy was owned by the BSA--Sea Scouting had obtained and converted many ships decommissioned after WWII. Inspired by an article he read in Boys’ Life about the adventures of reporters working around the world, Boy Scout Walter Cronkite went on to become the face of television news in the United States. During the 1970s, Kenner Products developed a line of Scout action figures whose right arms, when raised, made the Scout salute. In Scouting’s early years, institutions such as Cornell University, Columbia University, and the universities of Virginia, Wisconsin, Texas, and California offered training courses for Scout leaders. More than 400 colleges and 34 seminaries offered such courses by the mid-1930s—half for college credit. As part of the two-year “Strengthen the Arm of Liberty” campaign in 1949–50, Scouts erected more than 200 81/2-foot-tall replicas of the Statue of Liberty across the country. Following the terrorist attacks on Sept. 11, 2001, the statue on Seattle’s Aiki Beach became an impromptu memorial and gathering place for stunned Seattle residents. King Carl XVI Gustaf of Sweden has dived from the Florida National High Adventure Sea Base. The total number of merit badges earned in 1911 was 85; the number earned in 2008 was 1,913,676. Virtually unchanged since 1911, the design of the Plumbing merit badge is a water faucet. Dr. E. Urner Goodman, the founder of the BSA’s national honor society, the Order of the Arrow, was once a volunteer Scoutmaster of Troop 1 in Philadelphia. Early Scouting leaders James E. West, Daniel Carter Beard, and Ernest Thompson Seton sat on first Eagle Scout Arthur Eldred’s Eagle board of review. The Kansas City Area Council has had an exceptionally productive advancement program and won the distinction of “Most Eagle Scouts” from 1912 to 1969, totaling 13,943. The council still ranks in the top 10 today. Edward VIII, former Prince of Wales, is the only person who received the BSA Silver Buffalo Award (1929) and later became a king. The Silver Buffalo Award is awarded for distinguished service to youth. On September 10, 1910, S. F. Lester of Troy, New York, became the first person to hold the Scouting leadership position of Scoutmaster (commissioned by the BSA). Today, approximately 100,000 Cub Scouts, Boy Scouts, and Venturers with disabilities are registered with the Boy Scouts of America in more than 4,000 units chartered to community organizations. In 1912, five of the 23 Eagle Scouts came from West Shokam, New York. Chess legend Bobby Fischer was the author of a chess column called “Checkmate” in Boys’ Life from 1966 until 1969. Eagle Scouts who served as Chief Scout Executive include Joseph Brunton Jr. (1960–1966), Alden Barber (1967–1976), Harvey Price (1976-1979), James Tarr (1979–1984), Jere Ratcliffe (1993–2000), and current Chief Scout Executive Robert Mazzuca. Charles Scruggs of Cuero, Texas, was reportedly the first recipient of the Honor Medal for lifesaving in 1911. Ernest Lawrence was the first Boy Scout to have a chemical element named in his honor: lawrencium. He was also the first former Scout to win the Nobel Prize for Physics, in 1939. In June 1942, Time magazine dubbed the BSA “Public Scavenger Service #1” for its outstanding wartime collection drives. It is believed that Robert Baden-Powell and W. D. Boyce never met. Raymond Cobb was 25 when he reportedly became the first “Complete Scout,” completing all merit badges and earning Eagle, Ace, Ranger, Silver, and Quartermaster Awards. This was before the age limitation for such awards was set at 18. The seven Mercury Project astronauts designed the original requirements for the Space Exploration merit badge. Mickey Mouse, who was created in 1928, was the authorized name of a patrol in the 1930 Bronx Council Troop 246. “Uncle Dan” Beard wrote that his greatest honor was having a mountain named after him—Mount Beard, which adjoins Mount McKinley. During the Depression, the BSA employed special railroad executives who started and supported Scout troops in some 300 rural communities along railroad lines. In 1952, the World Book childrens encyclopedia published a special book on each of the merit badge subjects. The BSA was the first youth-serving organization to have a U.S. combat vessel, the USS Esteem, dedicated in its honor. It launched in December 1952. During World War II, Scouts collected 7,000 tons of clothes for people in Europe and Asia. In 1964, 41 Scouts were the first to earn merit badges for Oceanography, presented to them by Rear Adm. Denys W. Knoll. The pages of Boys’ Life have been home to noteworthy writers such as Alex Haley, Arthur C. Clarke, Ray Bradbury, Isaac Bashevis Singer, Van Wyck Brooks, Ernest Thompson Seton, Bobby Fischer, Catherine Drinker Bowen, Robert A. Heinlein, Isaac Asimov, Arthur B. Reeve, and John Knowles. Presidents John F. Kennedy, Gerald R. Ford, George W. Bush, Bill Clinton, and Barack Obama were Scouts as youth, and Jimmy Carter was a Scoutmaster. President Kennedy was the first Scout to become president; Gerald Ford was the first (and to date, only) Eagle Scout president. In 1935, the Silver Jubilee of Scouting was celebrated and membership passed 1 million. The first National jamboree was canceled that year because of an infantile paralysis (polio) epidemic. It was held two years later in Washington, D.C. In 1982 saw the beginning of BSA’s Tiger Cub program for 7-year old boys and adult family members. In 1979 the National office of the BSA was moved to Irving, Texas. Actors Richard Dean Anderson (Stargate SG-1, MacGyver), Harrison Ford (Star Wars, Indiana Jones), and Jimmy Stewart (Rear Window, It's A Wonderful Life) were all Boy Scouts. In 1930, the Cub Scout program was officially launched. By the end of that year there were 5,102 Cub Scouts. In 2008 there were 1,913,676 merit badges earned nationwide. The top five were First Aid (84,419), Swimming (75,568), Environmental Science (72,150), Citizenship in the World (60,582), and Camping (58,654). In 1910 the Boy Scouts' Board members included the Boy Scouts of America's founding fathers: Daniel Carter Beard, national Scout commissioner; and Ernest Thompson Seton, Chief Scout. James E. West was appointed executive officer. The National Council office was established at 200 Fifth Avenue in New York City on January 2, 1911, with seven employees. In 1912, a few weeks after becoming the first Eagle Scout, Arthur Eldred helped save another Scout from drowning and was awarded the Honor Medal for his actions. In 1911, the first edition of the Handbook for Boys was published. Some 300,000 copies were printed. The day after the United States declared war on Germany in 1917, under the slogan "Every Scout to Feed a Soldier," BSA members were urged to plant vegetable gardens. In two plant-growing seasons, 12,000 Scout farms were established. At the same time, the BSA pledged to aid the American Red Cross and promised cooperation with the U.S. Navy by organizing Scout coastal patrols to watch for enemy ships. The Boy Scouts of America celebrated its 75th anniversary in 1985. Theme for that Diamond Jubilee year was “Pride in the Past … Footsteps to the Future. The pinewood derby cars made since 1954 could form a line stretching from Los Angeles to New York and back — a total of more than 5,500 miles. In January, 1986 the BSA was touched by the Challenger disaster, as two of the space shuttle crew members were active in Scouting as youths. Lt. Col. Ellison S. Onizuka attained Eagle Scout rank in 1964 in Holualoa, Hawaii. Dr. Ronald E. McNair reached Star rank as a youth in Lake City, South Carolina. In the 1940's, long trousers and the Scout cap become part of the official uniform. The National Eagle Scout Association (NESA) was founded in 1972. In 1937 the first National jamboree of the BSA was held in Washington D.C. In 1920 the first BSA National Training Conference was held for professional Scouters. The Explorer Scout program was first authorized in 1933. Project SOAR (Save Our American Resources), a continuing conservation Good Turn program was launched by the BSA in 1970. In 1924 the first achievement badges were awarded to physically handicapped Scouts. In 1949 membership age minimums were lowered to 8 for Cub Scouts, 11 for Boy Scouts, 14 for Explorers. All boys 14 and older were designated Explorers, they could remain in a Scout troop as members of an Explorer crew or join a separate post. On Labor Day 1912, the first Eagle badge was awarded to Arthur R. Eldred of Troop 1, Oceanside, NY. Approximately 35.5 percent of West Point cadets were involved in Boy Scouting as youth, and 30.5 percent of Air Force Academy cadets were involved in Boy Scouting as youth. Of these cadets, nearly 14.3 percent are Eagle Scouts. Of the 312 U.S. astronauts, 180 were involved in Scouting, including 40 Eagle Scouts. The first Order of the Arrow members were inducted on July 16, 1915. Nationally, the Order of the Arrow ended 2007 with 171,894 members who provided 1,335,779 hours of service. Career-interest Exploring was introduced in 1959, and the program was opened to girls as well as boys ten years later. By the early 1970’s, more than 100,000 girls were Explorers and just about half of all posts centered their activities on a career or avocation. The 12,441 foot summit of Baldy Mountain is the highest peak on BSA’s Philmont High Adventure Base. In 1938, Waite Phillips, Tulsa, Oklahoma oil man gave 36,000 acres near Cimarron, New Mexico for development of what was first called Philturn Rocky Mountain Scout camp, now Philmont Scout Ranch. The Cub Scout program for younger boys began as a pilot project in several cities in August 1929. 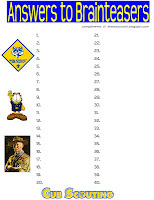 The first Cub Scout Pack charters were issued on April 1, 1930. In 1916 the first 57 merit badge booklets were published and distributed. On February 8, 1910, the Boy Scouts of America was incorporated in Washington D.C. by William D. Boyce. Although the BSA has always stressed the importance of every person’s religious duty, there were no Scouting awards for service to God until when the BSA and the Roman Catholic Church established the first religious emblem program, Ad Altare Dei (To the Altar of God). Since then many other Christian denominations as well as Jewish, Buddhist and Muslim religious groups have launched similar programs. Today there are 78 different awards for all levels of Scouting. Gerald Ford earned the rank of Eagle Scout in 1927 at the age of 14 and remained active in Scouting all his life even while he was President of the United States. The BSA started Scouting magazine in 1913, as a bulletin for Scoutmasters and issued the first edition of the Handbook for Scoutmasters. In an advance edition of the 1911 handbook, three badges were announced – Life, Star, and Wolf. By publication time, the highest (Wolf) had been replaced by Eagle. The first Boy Scout camp in the United States was held at Silver Bay on Lake George in upper New York State. Originally it had been planned as a Y.M.C.A. camp, with demonstrations by Ernest Thompson Seton of his Woodcraft Indians methods. However, by the time the two week camp opened on August 16, 1910, all the camp leaders were involved with the Boy Scouts of America so it turned into a Scout camp with an Indian flavor. Ernest Thompson Seton, artist and wildlife expert, founded the Woodcraft Indians in 1902 to teach boys about the outdoors. In 1910, he became the first Chief Scout of the BSA and rushed out the organization’s first handbook. Baden-Powell, the founder of Scouting, was born on February 22, 1857 in England. He was actually christened Robert Stephenson Smyth Powell. His mother changed the family surname to Baden-Powell in 1869 (when young Stephe, as he as known in the family, was 12 years old). "Once an Eagle, Always an Eagle" is an unofficial motto of Eagle Scouts, based on the Eagle Oath or Promise, which is a little different. The only context in which it is appropriate to say that someone "was" an Eagle Scout is if that Scout(er) is deceased. Seven Eagle Scouts have also been awarded the Medal of Honor. 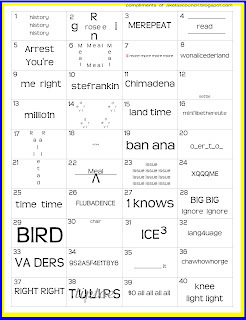 I made this printable word puzzle to be used for the Blue & Gold Banquet. Notice the links below to print out a clear PDF copy. Notice that their is a Red E in puzzle number 7. You will need to print this in color, or use a red marker to fix all of those so it makes it easier for people to get the answer. Answer to #1 - History repeating itself; Answer to #29 - Big Bird. Hope you enjoy this! 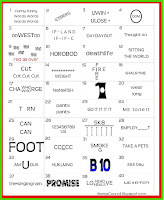 We have more word puzzles, and other kinds of printable puzzles on our blog. CLICK HERE to see this post for a different Rebus Word Puzzle. 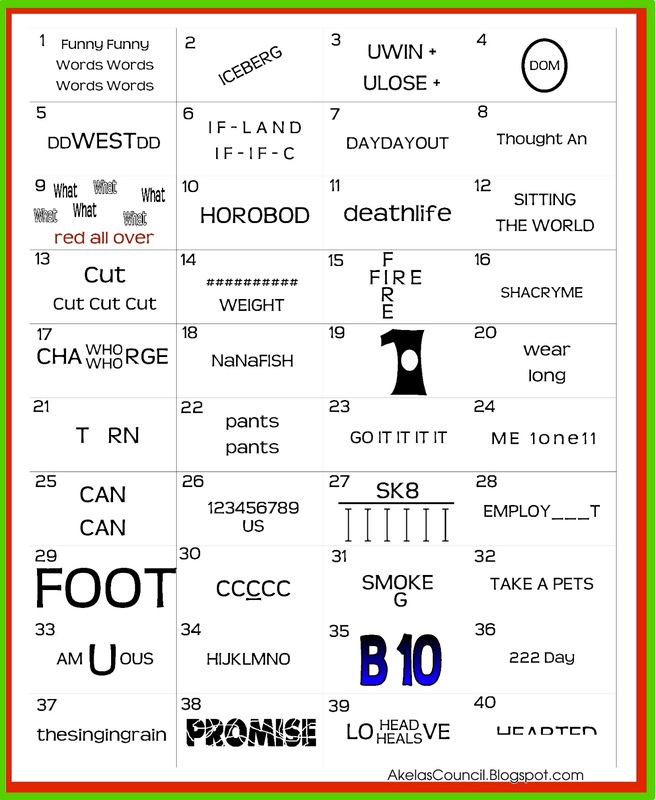 We have more word puzzles, and other kinds of printable puzzles on our blog. CLICK HERE to see this post for Christmas Songs & Carols. blog. CLICK HERE to see all the different posts that have puzzles. 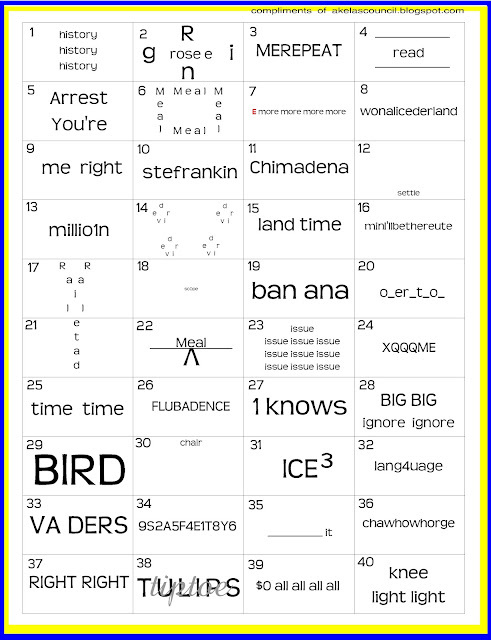 To print the new placemat shown below for 2014 with a completely new rebus puzzle, CLICK HERE. Here is the Blank answer sheet for everyone to fill out. At the top of the page is the link for the answer sheet you can print for yourself.